I follow The Guardian on Facebook, and a couple of weeks ago their feed was suddenly full of articles saying that scientists have increased the recommended five servings of fruit and veg a day to ten - articles from a health perspective, an economic perspective, roadtests, examples of people who already eat the recommended amount, meal plans, recipes, tips on how to get your 10-a-day and many more. It was all over the place! 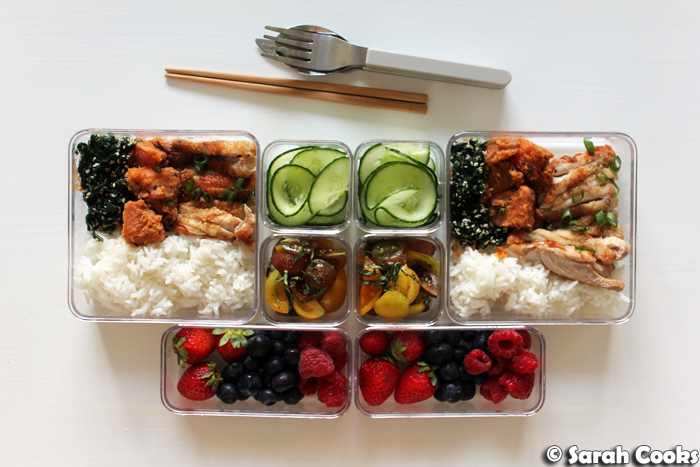 I found all of these very interesting, but my favourite article was this one, by Dale Berning Sawa, explaining that by adopting a Japanese style of home cooking - rice with lots of small sides - it is easier to get up to ten a day. She also included lots of quick and simple vegetable-based recipes to get you started. Very inspiring for my meal prep! 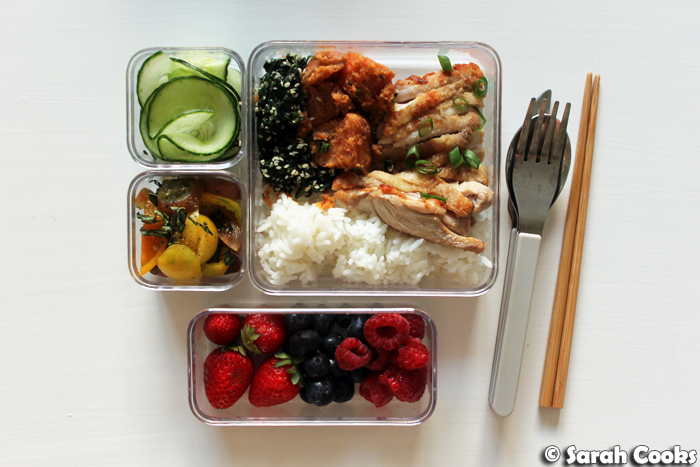 So, using this approach, this week's meal prep includes salt-grilled chicken, sweet potatoes with soy butter, and Japanese spinach salad, with a simple tomato-and-basil salad, plain shaved cucumber and rice to balance out the strong flavours of the first three dishes. Have you tried shioyaki before? This is a classic Japanese way of grilling meat. Literally it means "salt-grilled", and in my opinion is so much nicer than the ubiquitous teriyaki. When I was a teenager, I found a recipe for tori no shioyaki (salt grilled chicken) in an old Japanese cookbook that my mum had, and have cooked it many times since. When writing this post, I did a quick search and couldn't find any recipes for it online, and unfortunately you can only occasionally find shioyaki at restaurants here. (If you can find gyu-tan shioyaki, salt-grilled ox tongue, you must try. It is The Best). Luckily, tori no shioyaki is really easy to make. 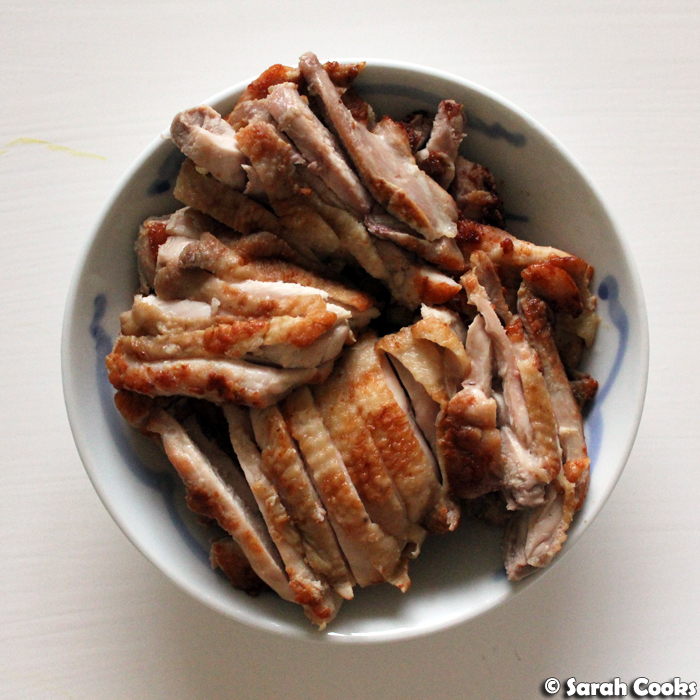 Just marinate your chicken pieces in sake and lots of salt for a few hours, then fry or grill. The sake tenderises the meat and makes it super succulent. I used chicken thigh fillets for this, but you can use whatever cut you like. You could also cut the chicken into little pieces, thread them onto a skewer and barbecue - great for parties! 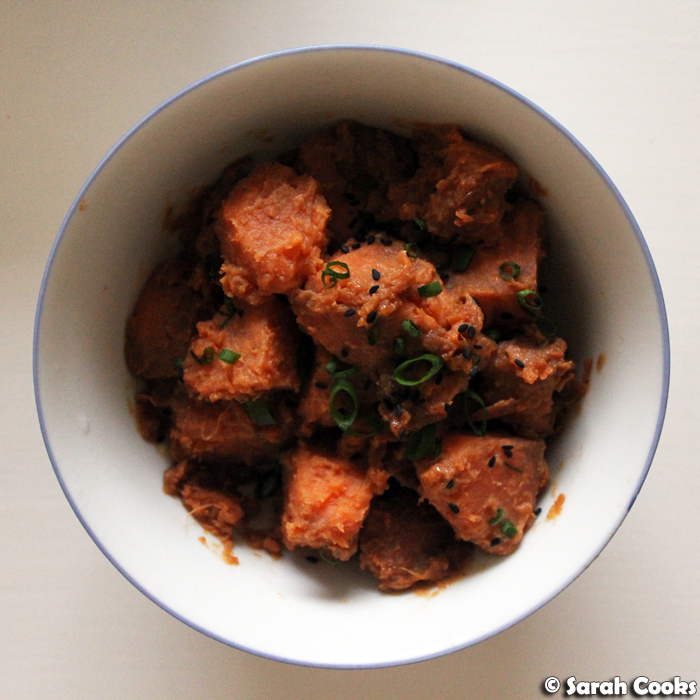 This sweet potato dish is a version of a Bill Granger recipe for soy-butter potatoes, where you toss boiled potatoes through a mixture of melted butter, soy sauce and a little sugar. It's really, really good. For reasons I will never fathom, regular potatoes are counted as a starch, not as a vegetable, but I thought that sweet potatoes would take well to this treatment. Turns out that they do! Woohoo. This spinach salad is a common side dish in Japanese restaurants - cooked spinach with a dressing of sesame seeds, mirin, and soy sauce. I love spinach, and something this deeply green just has to be good for you. This was a great meal prep - I loved the variety of different dishes, and it kept well throughout the week. I found it nourishing but not heavy, and of course I got to feel really smug that I managed to fit so many vegetables into my lunch. Take 4 boneless, skin-on chicken thighs and pat dry. (Optional, grate a little fresh ginger and rub it onto the skin). Sprinkle the skin with 3/4 teaspoon salt. 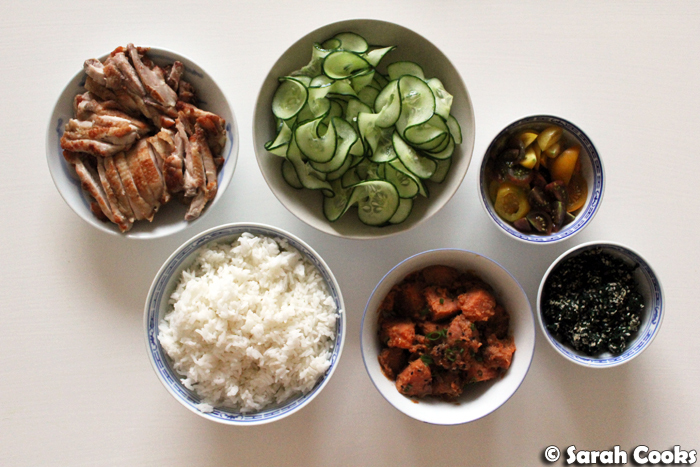 Place the chicken pieces into a shallow container and pour sake over to cover. (Hot tip for non drinkers and the budget conscious: Lots of supermarkets sell cooking sake, which is cheaper than proper sake from a bottle shop). Allow to marinate in the fridge for an hour or so. Remove the chicken from the fridge, discard the marinade, and cook the chicken pieces in a hot frying pan or grill until cooked through and golden brown. Allow to rest on a chopping board before slicing thickly. Garnish with nanami togarashi and spring onions. Peel a large sweet potato and chop into roughly 2.5 cm chunks. Cook in boiling salted water until just tender, then drain. (You will cook the sweet potatoes more later, so don't overcook). Place the sweet potato pieces into the still hot, but now dry, saucepan, and add 25 grams butter, 1 tablespoon soy sauce and 1.5 teaspoons caster sugar. Stir to combine. Place on a medium heat and cook for 5 minutes, stirring gently, for about 5 minutes or until the liquid is absorbed. 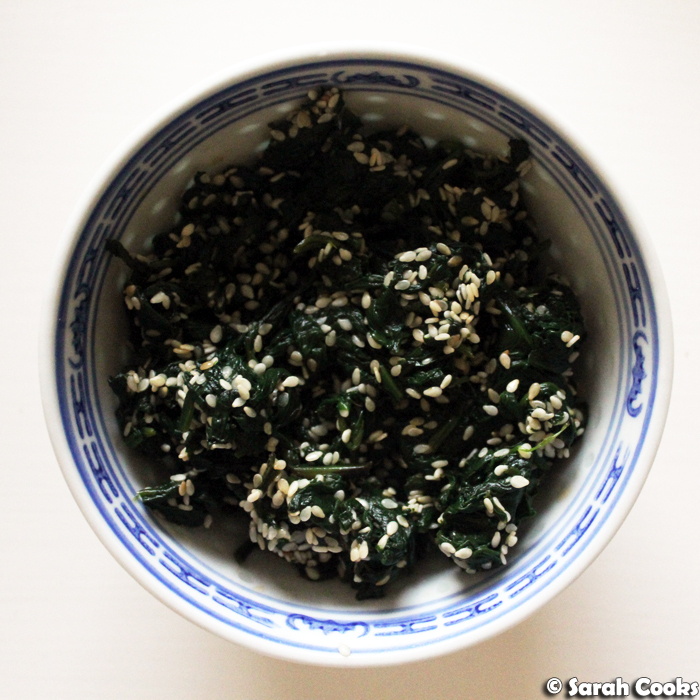 Garnish with black sesame seeds and chopped spring onion. Cook 200 grams of baby spinach leaves in salted boiling water for one minute, then drain and refresh in a bowl of iced water. Drain again and squeeze out at much water as possible. Form the cooked spinach into a rough log, then cut into four pieces and set aside. Mix together 1/2 teaspoon mirin, 1/2 teaspoon sake, 1 tablespoon roasted white sesame seeds, 2 teaspoons soy sauce and 1/2 tablespoon white sugar. Stir the spinach through the dressing and serve. I'd happily eat this for lunch. And yes, having interesting little veggie side dishes makes that quota so much easier to reach! YUM!! And ye to shioyaki-love it too. Now 10 serves? I have no idea if I get that close but I try. They're really convenient and are so well designed!